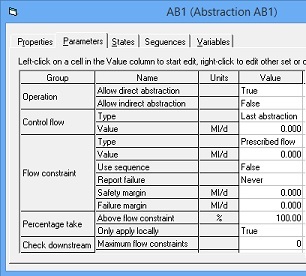 Simulation of complex, conjunctive use water resource systems is a difficult task and is seldom straightforward. Ostensibly similar components such as river abstractions and reservoirs are often operated in ways which are specific to each case. Furthermore, there are often complex interrelationships between components. For example, regulation releases may be triggered from a reservoir in response to hydrological conditions, state of reservoirs elsewhere and possibly state of other potential regulation sources. The decision-making process that determines, on a day-to-day basis, where water will be abstracted to meet demand is not one purely based on cost optimisation and link capacity. Other factors such as the state of a resource or state of an abstraction licence are often equally, if not more, important. Aquator enables you to construct a representation of your system on-screen by dragging and dropping components from the toolbox onto the schematic area. Once you have constructed your schematic from the available components and entered values for the parameters required by each component, you will have a fully working model. 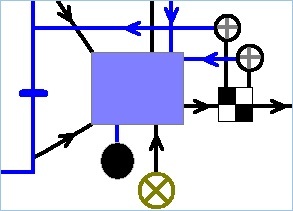 Each component encapsulates a set of operating rules. Aquator seeks to satisfy the daily demand by automatically enforcing these rules no matter how complex the system. While obeying these rules Aquator executes Aqua solver. This is a linear optimisation algorithm, which tries to find the best solution for daily water movement by supplying at lowest cost when water is plentiful or supplying according to the state of resources when water is scarce. 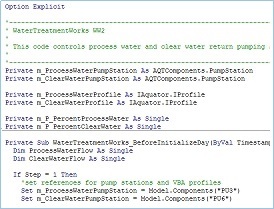 When you have custom rules specific to your organisation, or complex interrelationships between components, you can use Microsoft® Visual Basic® for Applications (VBA) to modify the built-in rules. This is the same tool as found in Microsoft Excel®. Many users of Aquator are comfortable using VBA themselves, but should you not wish to undertake customisation yourself you can employ the services of any VBA programmers world-wide who are familiar with this industry standard programming language. You can customise a model as little or as much as you wish, even entirely replacing the operating rules built into each component. Even this does not exhaust the possibilities provided by VBA. You can write VBA macros that perform non-operational tasks such as global parameter modifications, analysis of results, custom data entry forms and more. In this way you can extend Aquator to meet your requirements. Aquator has an open software architecture and we actively encourage and support third parties to add new components and features. See the online manual for more information.